CBS, SHOWTIME and the CW will make their mark at Comic-Con 2012 with star-studded sessions and signings, including premiere screenings of new series and first looks at the new seasons of returning hits. CBS Corporation’s extensive presence includes cast and creative team panels with exclusive debuts of episodes, clips and trailers; non-stop booth activity with autograph signings, contests and giveaways; “CBS Buzz Tour” activities and swag; interactive opportunities and on-site coverage via CBS Interactive’s CBS.com, GameSpot and CNET; and the CNET Base Station featuring GameSpot. The panels will include a CBS Television Studios/CBS session and world premiere pilot screening for the highly-anticipated new series ELEMENTARY, a contemporary take on the legendary characters of Sherlock Holmes and Dr. Watson starring Jonny Lee Miller and Lucy Liu; a SHOWTIME panel and sneak peek of the first two minutes of the upcoming season premiere of the Emmy-nominated series DEXTER and a first-look trailer of the Golden Globe Award-winning series HOMELAND; the SHOWTIME panel for the hit series SHAMELESS; the CBS Television Studios/CW panel and pilot premiere viewing of the new series BEAUTY AND THE BEAST, a modern adaptation of the beloved fairy tale; and the CBS Home Entertainment panel “Before and After: A Behind-The-Scenes Look at STAR TREK: THE NEXT GENERATION’s Journey into High Definition,” featuring illustrative before and after clips and a sneak peek at all-new featurettes. Stars scheduled to participate include Kristin Kreuk and Jay Ryan from BEAUTY AND THE BEAST; cast members of the Emmy Award-nominated THE BIG BANG THEORY; Joe Mantegna, Thomas Gibson, Matthew Gray Gubler, AJ Cook, Kirsten Vangsness and new cast member Jeanne Tripplehorn from CRIMINAL MINDS; Michael C. Hall, Jennifer Carpenter and Yvonne Strahovski from DEXTER; Jonny Lee Miller and Lucy Liu from ELEMENTARY; Ben Schwartz from HOUSE OF LIES; Pauley Perrette from NCIS; Jim Caviezel, Michael Emerson, Taraji P. Henson and Kevin Chapman from PERSON OF INTEREST; William H. Macy, Emmy Rossum, Justin Chatwin, Cameron Monaghan and Jeremy Allen White from SHAMELESS; and even Craig Ferguson's robot skeleton sidekick, Geoff Peterson. CBS.com will offer a window into CBS events, news and action at Comic-Con for fans throughout the country via www.cbs.com/comiccon. Coverage will include interviews with attending CBS stars, man-on-the-street interviews, on-demand video coverage of the CBS series panels and photos from key Comic-Con and CBS events, including autograph signings and CBS booth activities. In addition to CBS.com, fans can get real-time updates through Twitter (@CBSatComicCon or @CBS) and Facebook (www.facebook.com/CBS), including live-tweeting of panels and events and access to photos and video. For the second year in a row, CNET along with GameSpot will host an interactive station at the iconic Lou & Mickey’s restaurant located in “Ground Zero,” the gateway between San Diego Convention Center and the Gaslamp Quarter where tens of thousands of Comic-Con goers walk by each day. The CNET Base Station featuring GameSpot will be open to all Comic-Con show attendees the first three days of the show (Thursday, July 12-Saturday, July 14) where they can recharge mobile devices, refuel, enjoy some free grub, win cool prizes and play some of the hottest video game titles. Additionally, GameSpot will cover Comic-Con from the gaming perspective, with a live-streaming stage show at Lou & Mickey’s from 1:00 PM-4:00 PM, PT (4:00 PM-7:00 PM, ET), on Thursday, July 12, Friday, July 13 and Saturday, July 14. GameSpot coverage will also feature a camera person roaming the show floor who takes direction from users at home, who can email their requests to livecamtour@gamespot.com. Visit www.comic-con.gamespot.com closer to the event for regular updates. “Survivor” winner Jenna Morasca will serve as the official Master of Ceremonies at the CBS/SHOWTIME/CW booth (#4129) on Saturday, July 14 and Sunday, July 15, welcoming and informing fans about the company’s various Comic-Con activities, as well as hosting numerous trivia games with fun prizes. Booth giveaways throughout the five days will include handy ELEMENTARY string bags to hold special swag; “CBS Good-eBag cards” to access free downloads of a variety of prized CBS television and publishing content; PERSON OF INTEREST screen cleaners; Sharpies for THE BIG BANG THEORY, 2 BROKE GIRLS, PERSON OF INTEREST and ELEMENTARY; special “Star Trek: The Next Generation” 25th anniversary posters for 1701 lucky fans; the very first cycling jerseys to feature iconic art from “Star Trek: The Original Series”; sought-after U.S.S. Enterprise NCC-1701-D ornaments from Hallmark marking the 25th anniversary of Picard’s brave crew; exclusive collectible BEAUTY AND THE BEAST lenticular buttons; and to-be-announced SHOWTIME items. Plus, back by popular demand, the booth will again feature the green screen photo booth, which enables fans to insert themselves within cast shots for select CBS, SHOWTIME and CW series. Additionally, as a key stop on CBS’s summer-long “CBS Buzz Tour” (#cbsbuzz) campaign, the Network’s star-branded and mobile studio-equipped “CBS Buzz Tour” bus will be at Comic-Con through Saturday, July 14. CBS reality star veterans Alex Boylan (THE AMAZING RACE) and Burton Roberts (SURVIVOR: PEARL ISLANDS), will lead the Buzz Tour’s on-the-road fan activities and will engage viewers from anywhere in the U.S. with CBS.com webisodes, blogs and social media contests and posts. In San Diego, they will give fans special CBS-branded Comic-Con swag, secure behind-the-scenes interviews with CBS stars at the conference and facilitate having the stars answer fan questions submitted via Twitter. Buzz Tour schedules and content will be accessible via www.cbs.com/buzz. Fans can also follow via www.facebook.com/cbsbuzz or on Twitter at @cbsbuzz, @alexboylan and @burtonroberts. “Star Trek: The Next Generation” fans are finally getting their wish, with all seven seasons of the beloved series being retransferred into high-definition. “Star Trek: The Next Generation – The First Season” will be released on Tuesday, July 24, and the team behind the project will give fans an insider’s look at how the original film elements were transferred into high-definition and how the visual effects were painstakingly recreated from the source material to look better than ever. The session will include a first look screening of before and after clips (standard definition versus high definition on Blu-ray). Robert Meyer Burnett will moderate the panel, which includes Roger Lay, Jr. (Producer/Director, Blu-ray), Mike and Denise Okuda (Project Consultants), David S. Grant (Vice President, Multimedia, CBS Television Distribution), Ryan Adams (Director, Multimedia, CBS Television Distribution), Craig Weiss (Creative Director, CBS Digital), Eric Bruno (Lead Compositor) and Wade Felker (Film Transfer Technician). For updates, check www.facebook.com/StarTrek or follow on Twitter at @StarTrek. Kristin Kreuk (“Smallville”) and Jay Ryan (“Terra Nova”) along with Executive Producers Jennifer Levin (“Without a Trace”), Sherri Cooper (“Brothers & Sisters”), Brian Peterson (“Smallville”) and Kelly Souders (“Smallville”) discuss the new CW fall series, a modern adaptation of a beloved fairy tale. Centering on Catherine Chandler (Kreuk), a tough-minded NYPD homicide detective who is haunted by witnessing her mother's murder nine years ago – as well as the murderer’s quick demise at what she perceived to be the hands of a beast. After years of searching, Catherine finally discovers the beast is Vincent Keller (Ryan), a survivor of a military experiment that went disastrously wrong and left him in hiding to lead a secret life. Join the cast and producers for an exclusive viewing of the first episode, followed by a panel discussion moderated by Dalton Ross (Assistant Managing Editor, Entertainment Weekly). For the latest updates on BEAUTY AND THE BEAST, go to www.cwtv.com/beauty-and-the-beast, www.facebook.com/BeautyandtheBeast, or follow on Twitter at @CW_Network, @CBSTVStudios and @MsKristinKreuk. Sir Arthur Conan Doyle introduced the world to Sherlock Holmes and Dr. Watson over 120 years ago, and this fall on CBS the dynamic duo gets a modern-day makeover cracking cases in contemporary New York City. Brilliant investigator Sherlock, played by Jonny Lee Miller (“Dexter”), is a recent rehab graduate paired with his worst nightmare: sober coach Joan Watson, played by Lucy Liu (“Charlie’s Angels”). Together, Sherlock’s unique detective skills and Watson’s medical expertise form a formidable force capable of solving the NYPD’s most impossible cases. Comic-Con guests will be the first to see the premiere episode of the new television series, followed by a panel discussion with series stars Jonny Lee Miller, Lucy Liu, Executive Producers Robert Doherty and Carl Beverly moderated by Entertainment Weekly’s Assistant Managing Editor, Dalton Ross. For the latest updates on ELEMENTARY, go to www.cbs.com/shows/elementary, www.facebook.com/ElementaryCBS or follow on Twitter at @Elementary_CBS and @CBSatComicCon. The gasps from last season’s finale can still be heard among every DEXTER fan as their worst fears were realized… Dexter got caught, and by none other than Deb! What will he do, what will she do… what’s next for America’s favorite serial killer? If the suspense is killing you, then don’t miss this incredible panel, where you’ll be the first to see the Comic-Con exclusive first two minutes of the season premiere. Moderator Ralph Garman (KROQ entertainment reporter) presides over a revealing interview and Q&A session with the stars and executive producers of the Emmy Award-nominated Dexter. Featured panelists include series star/executive producer Michael C. Hall (Dexter), Jennifer Carpenter (Deb), the series’ upcoming special guest star Yvonne Strahovski and executive producers John Goldwyn, Sara Colleton and Scott Buck. Plus, Dexter fans will be the first to see the world premiere trailer of one of the hottest series on television, the Golden Globe Award-winning Homeland, presented by executive producers Howard Gordon and Alex Gansa. 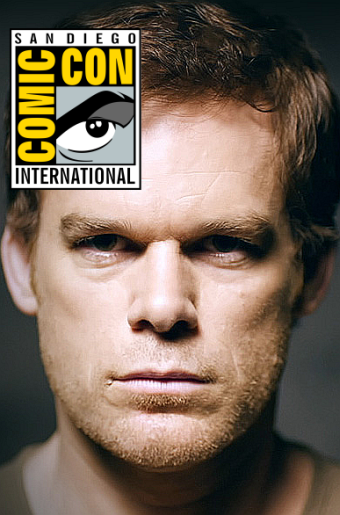 Prior to the DEXTER panel, SHOWTIME will also debut the first chapter of the new season of the animated webisode series “Early Cuts: All In The Family,” narrated by Michael C. Hall, written by Dexter producer Scott Reynolds and illustrated by celebrated comic book artist David Mack. “Early Cuts: All In The Family” continues to tell important stories from Dexter Morgan's past – this season written thematically to tie-in to the season six cliffhanger, as Dexter reflects back on other instances where his sister, Deb, has sensed his darkness. For the latest updates on DEXTER and HOMELAND and behind-the-scenes coverage of Comic-Con 2012, go to www.facebook.com/dexter, www.facebook.com/HomelandOnShowtime or follow on Twitter at @SHO_Dexter, ‏@J2thecarpenter, @Y_Strahovski, @SHO_Homeland and @HowardMGordon. The mischievous, unabashed Gallagher clan returns to Comic-Con for a completely shameless panel! Meet the cast and creative team behind one of the hottest SHOWTIME original series, Shameless, moderated by series' writer and consulting producer Mike O’Malley (“Glee”). This scrappy, unique family is incredibly engaging, but being a Gallagher isn’t always as easy as it looks. The cast and executive producer discuss how they capture some of their most shameless moments, plus be there when they answer fan-submitted Twitter questions and reveal the Top Five Fan Favorite Moments as voted on by you! Featured panelists include William H. Macy (Frank), Emmy Rossum (Fiona), Justin Chatwin (Steve), Cameron Monaghan (Ian), Jeremy Allen White (Lip) and more, along with executive producer John Wells (West Wing, ER, Southland). For the latest updates on SHAMELESS and behind-the-scenes coverage of Comic-Con 2012, go to www.facebook.com/ShamelessOnShowtime or follow on Twitter at @SHO_Shameless, @emmyrossum, @Justingchatwin and @cameronmonaghan. Don't suppose ComicCon does live streaming for those of us on the other side of the world? Would micheal c hall be doing signings?